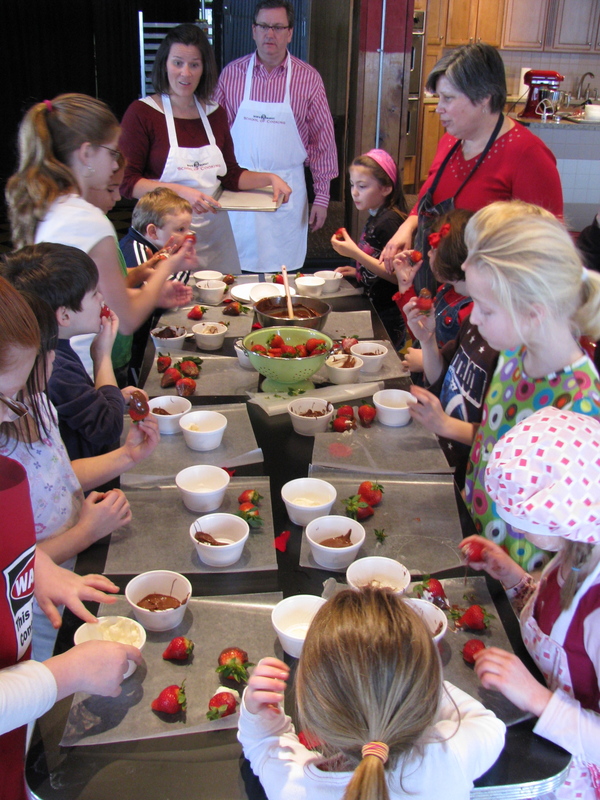 On May 1st I will be teaching a Mother’s Day kids cooking class at the North Market’s Dispatch Kitchen. We will be making vegetable robots, homemade pasta and ravioli, butter and chocolate truffles as a gift for Mother’s Day. I am really looking forward to it. Last month I assisted at Sheri Lisak’s kids Valentine’s Day class and it helped me to finalize what I want to teach and how much we can do during the 90 minute class. 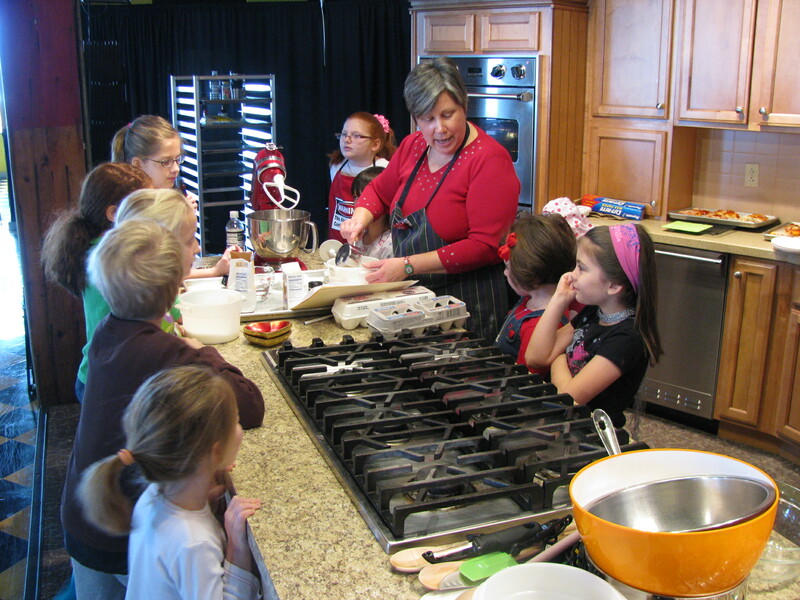 Sheri is a veteran cooking teacher and was fantastic with the kids. I was amazed at how engaged they stayed for the hour and a half class, moving from one cooking station to another. 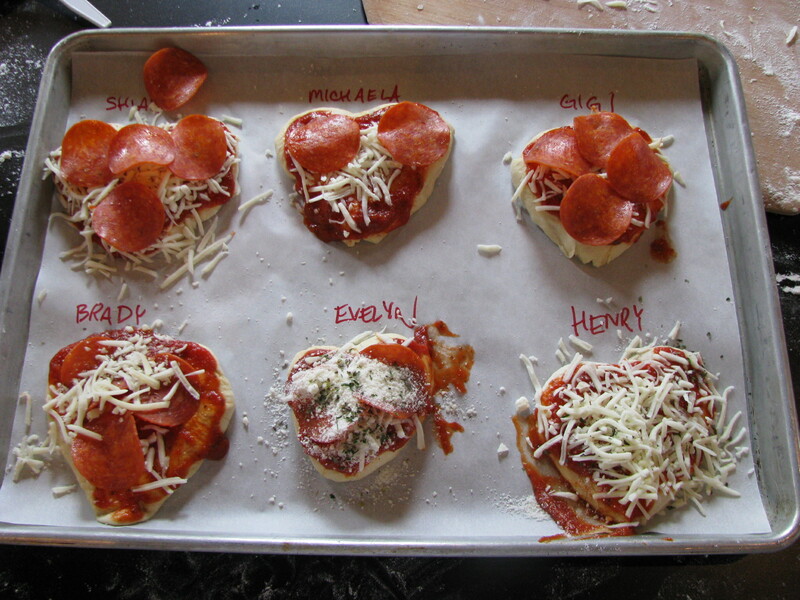 As you can imagine for a Valentine’s class there were lots of hearts and we made heart shaped pizza and heart shaped cookies as well as salads and salad dressing and finally strawberries dipped in chocolate. The young chefs had plenty of chances to choose their own toppings and designs, be creative and show their artistic talents. They were a lot of fun and it was great to see their enthusiasm for making their own food and hearing about what they like to cook at home. It was also good to see some of them trying new vegetables and flavors. If you have, or know any budding chefs, we would love to have them join the class. Aprons, or clothes that can get covered in flour are a good idea! 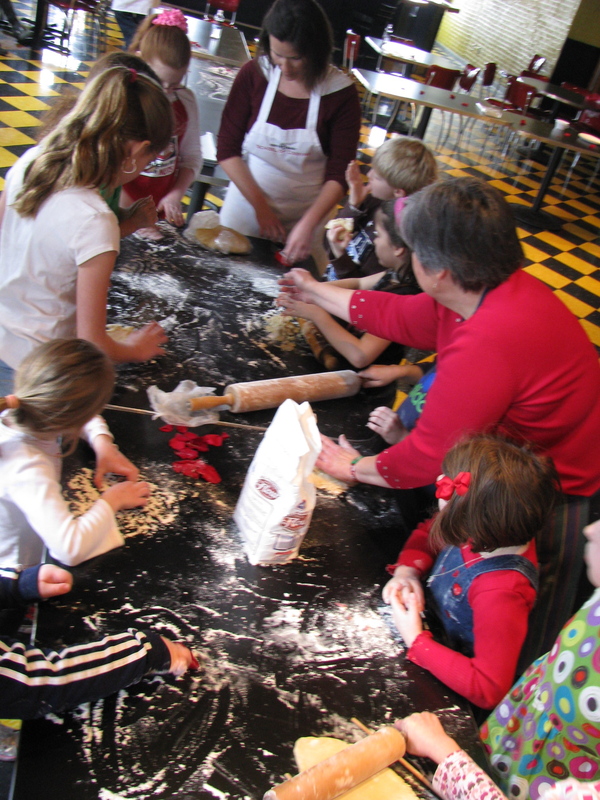 Parents are welcome to stay for the class, or can take the time to explore the North Market. More details and sign up are here. The Fiery Foods Festival is a fun North Market event with competitions for chefs, amateur cooks and crazy people who want to see how many hot peppers they can eat. Appropriately held in one of the coldest months of the year, the Fiery Foods Festival is definitely a winter warmer. Many of the vendors get into the spirit promoting their existing spicy products or creating something for the occasion. 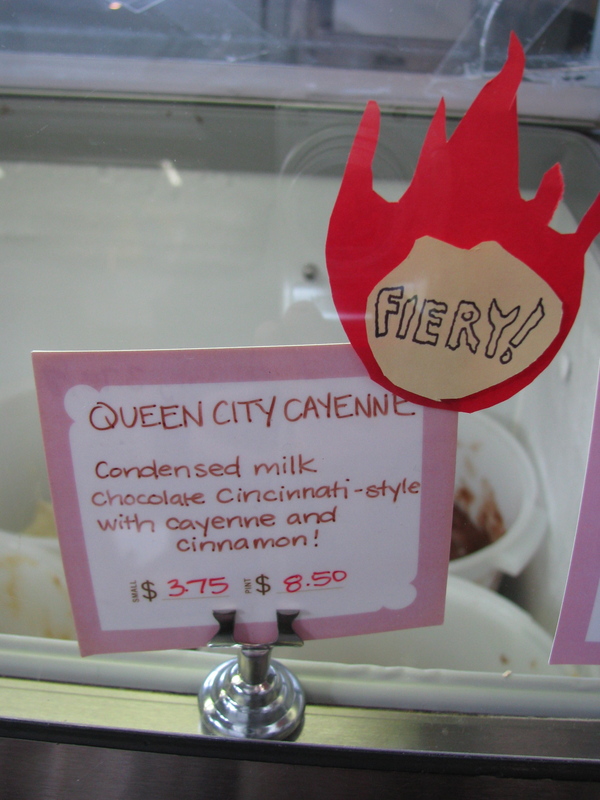 The Greener Grocer had an amazing array of peppers, Taste of Belgium had shrimp and grits waffles and Jeni’s were highlighting their spicy ice creams. For children there was face painting, sombreros and maracas and the lovely Ms Kelley sporting a hot pepper costume and handing out chili shaped cookies from Mozart’s Bakery. Upstairs there was so much chili in the air it was enough to make your eyes water. I had been asked to judge the Chef’s chili competition and was in the esteemed company of Johnny Di Loretto (Fox 28), G.A. Benton (Alive) and Miriam Bowers Abbott (The Other Paper). When I saw the line up of Chefs entered I knew it would be competitive event. We tasted 15 chilis at a furious pace and judged them on aroma, flavor, texture and an overall score. By the end with faces glowing and beads of sweat on our foreheads, one might have thought we had just worked out. Unsurprisingly there were a lot of strong contenders and also a lot of variety in seasoning – one strong on texas barbecue, one very cinnamon-scented, one Italian chili and several paired with a mini cornbread. At the judges’ table we could not hear the announcements and played an interesting game of ‘guess who’s? [I don’t think we did very well]. You can see the full list of entrants and read about the other competitions here. 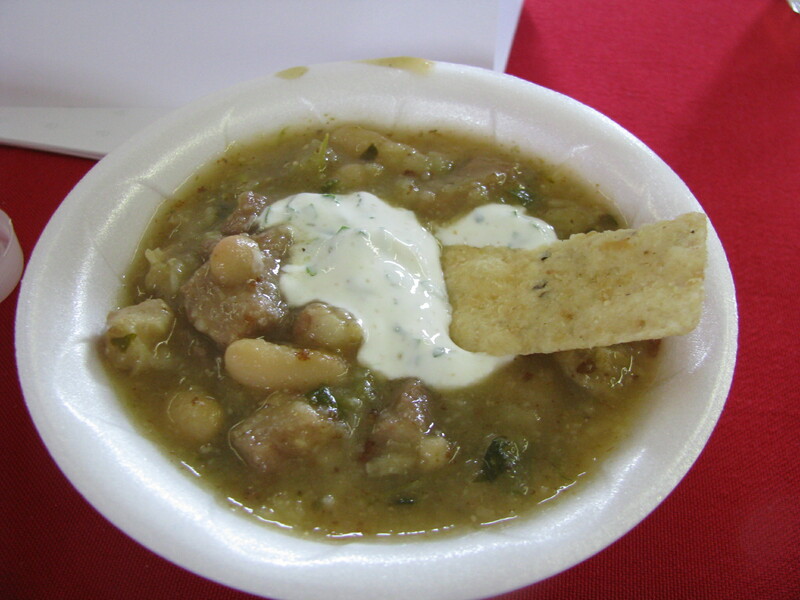 Second place went to a pork and white bean green chili soup made by Michael Ciotlola, now retired but formerly chef at La Scala and Luce. His chili, while perhaps not the most traditional, was extremely fragrant and flavorful and tasted like Mexico in a bowl with lots of tomatillo, corn and cilantro. 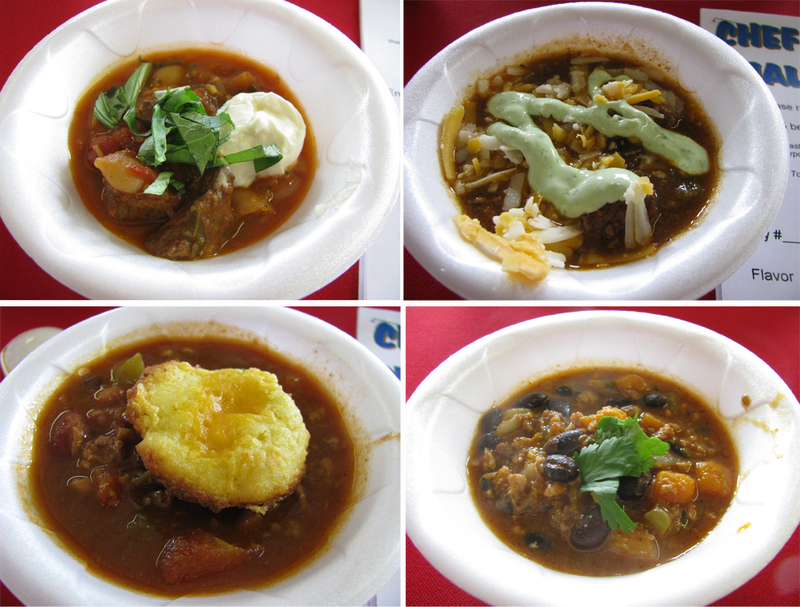 The winning chili was the last one we tasted. It was presented with a taste of marshmallowy Mexican hot chocolate which was a welcome treat after 15 samples of chili. 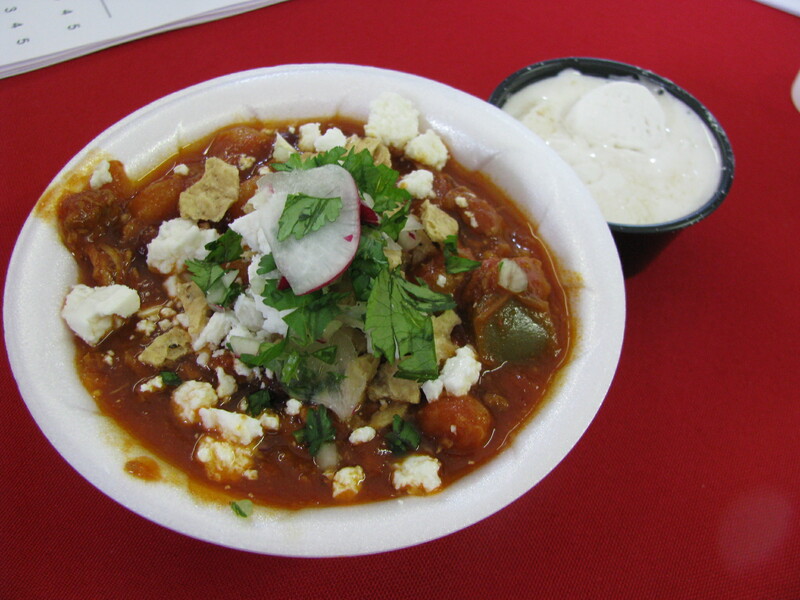 The final chili was made by Reymundo Rico from Cafe Corner and he had spent the previous week perfecting his recipe. His “pazoli” chili was a great blend of moderately spicy chili with an undertone of mellow corn. The ingredients included slow-roasted, garlic-rubbed pork, cilantro, red pepper, sea salt and pork sausage basked in a “pazoli sauce” made with guajilla and ancho chilies, roasted purple tomatoes, roasted garlic, red onions, hominy, kidney and black beans. It is currently on the menu at Cafe Corner so I recommend that you stop by and try it for yourself. Who knows, maybe he’ll be wearing his robe! My friends Margaux and Tim very kindly offered to share some of their excess Thanksgiving CSA produce. Tim arrived on the doorstep with a huge bag of kale and a napa cabbage as big as a newborn baby. This bag of greens took up a whole shelf in the fridge and we spent over a week having a series of cabbage and kale based meals. 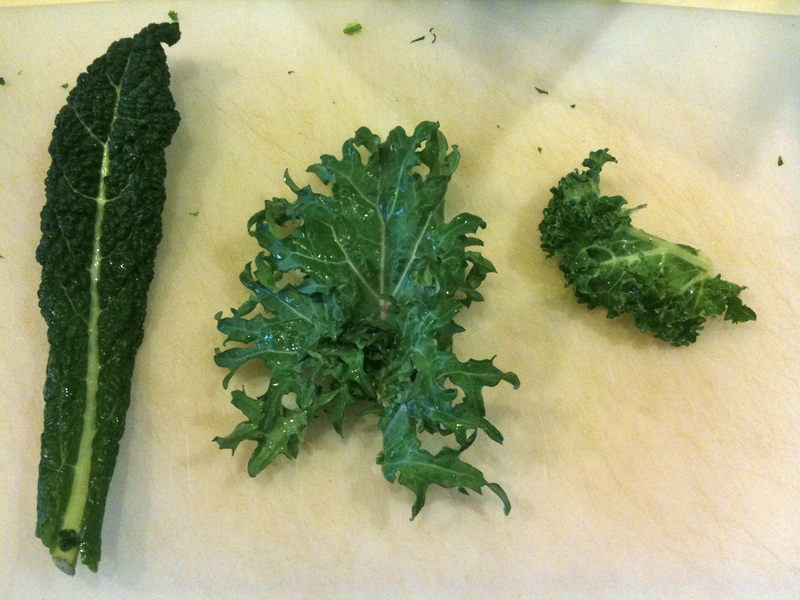 There were at least four varieties of kale in the mix, including lacinato (or dinosaur) kale, Russian kale and curly kale (pictured from left to right). The top picture is of red Russian kale. Kale is a form of cabbage that does not form a head. 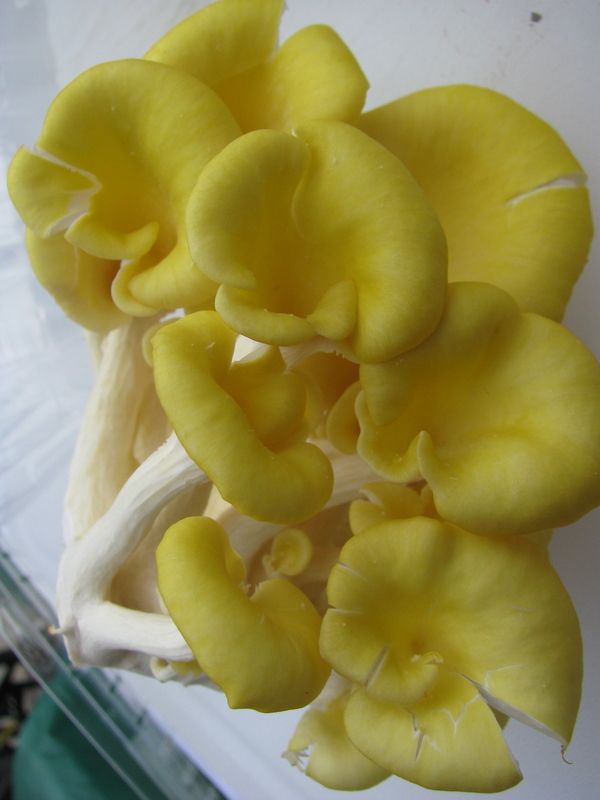 It is both hardy and nutritious but can be tougher than cabbage so it is often used in soups. 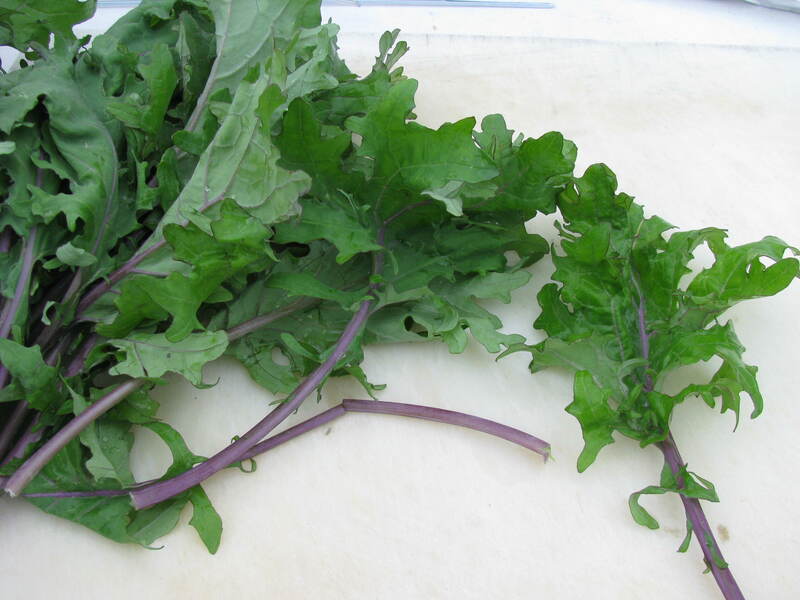 The taste varies between varieties but the lacinato kale has a taste reminiscent of savoy cabbage. We tried roasting the kale but our favorite preparation was inspired by the Slow Food Columbus locavore dinner. Our winning combination was finely chopped kale with a dressing of olive oil and lemon juice, salt and ground grains of paradise (similar to pepper but nuttier) with toasted almond slivers and shavings of parmesan cheese. It is a very refreshing, vibrant salad and even though I always think I have made too much, it always disappears. Napa cabbage is also known as Chinese cabbage. 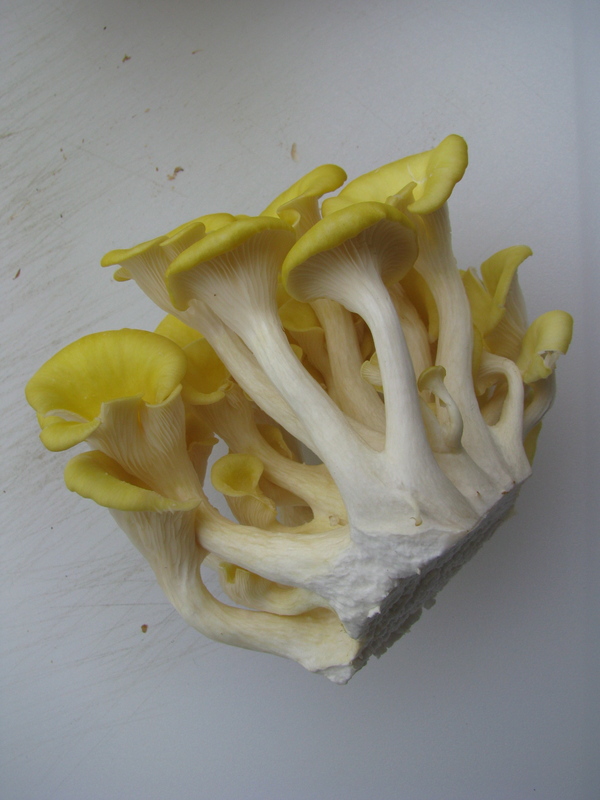 It has a more elongated head, more delicate leaves and is a paler green than regular cabbage. 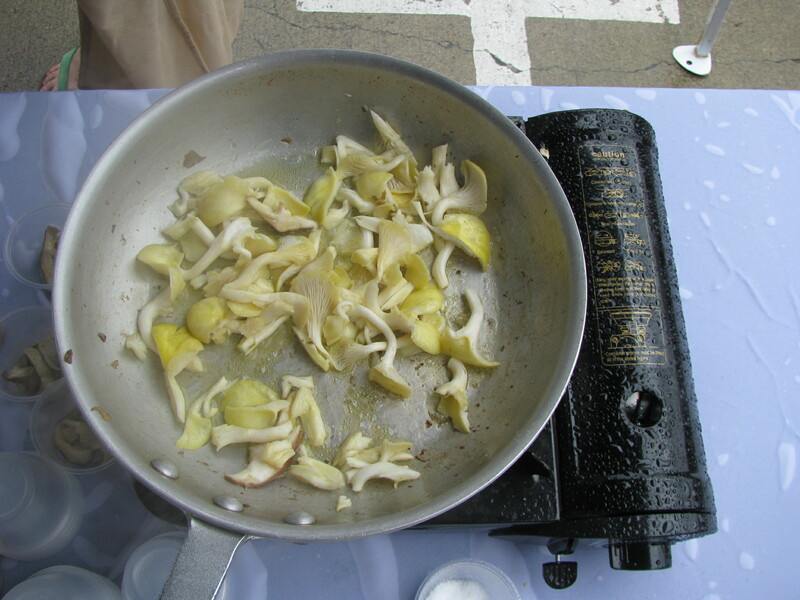 We used the napa cabbage in a stir fry with mushrooms, in a preparation similar to the way that I usually cook bok choi. I also added some thinly sliced cabbage into some noodles which I tossed with a sesame oil, mirin and soy sauce dressing. 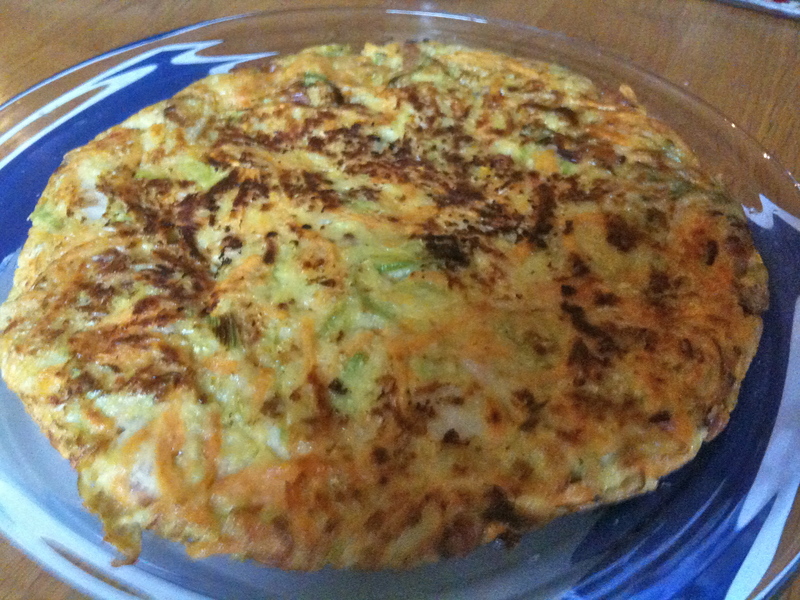 The most successful use of the napa cabbage was in a bastardized version of okonomiyaki. I used Heidi Swanson’s recipe as a starting point, but after reading the comments, doing some research and assessing what I had in the fridge I created my own version. This was enough to make 3 large pancakes. In a large bowl combine the flour, water and fish sauce until you have a smooth batter. Add the beaten eggs and mix well. 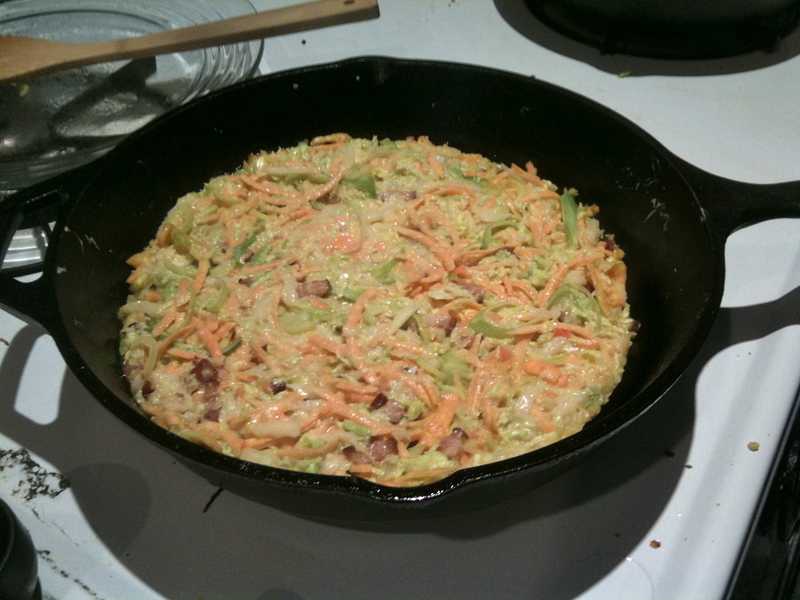 You can then add the vegetables, and ginger and bacon if you are using them. Mix the vegetables thoroughly into the batter until they are well coated with the mixture. Season. Heat a large skillet to a moderate heat. We used some of the bacon fat to cook the pancake but you could use oil or butter. Spoon some of the vegetable mixture into the pan and press it down with a spatula. Our completely filled the pan. It looks like coleslaw doesn’t it?! You do not want the pancake to cook too quickly or it will brown without cooking through. It is therefore best to keep the pancake thin.To flip it we slid the pancake out onto a plate, inverted the pan on top and then turned the whole thing over. We served it in wedges sprinkled with furikake which is a seasoning mix containing seaweed and bonito flakes, sesame seeds, mirin, soy sauce, sugar and salt. I buy it at Tensuke market at Kenny and Old Henderson. And so we came to the end of our huge bag of greens, but today I went to the North Market farmers market and I stocked up on cabbage from Elizabeth Telling, and Green Mountain potatoes from Wayward Seed Farm so I think I will be making bubble and squeak this week. 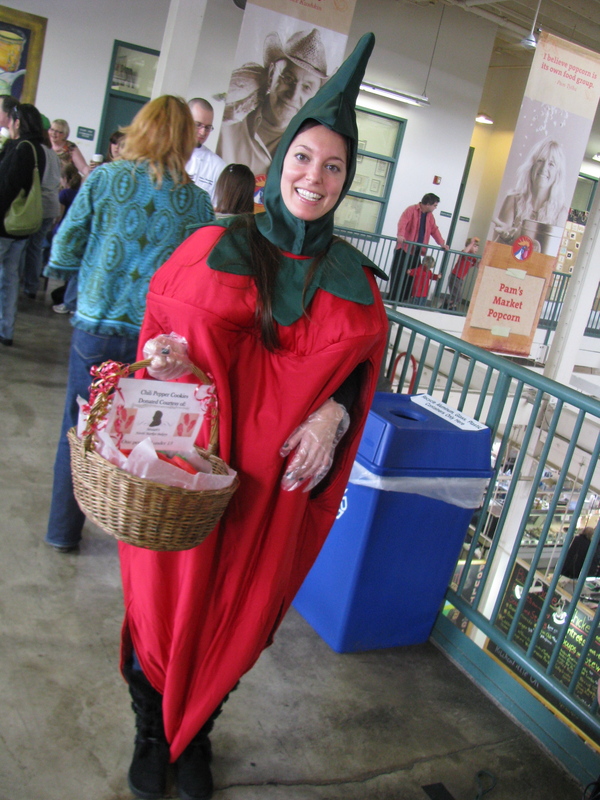 It was pretty exciting to still be shopping at the farmers market in December, in Ohio! – there were four farmers there braving the cold – it was in the 20s this morning. The offerings were mostly root vegetables (including radishes, turnips, rutabagas, potatoes, sweet potatoes) but also squash, brussels, celery, lettuce, greens and some herbs. Roasted chestnuts were quite a treat too. Last Sunday I was a volunteer helper at a Dispatch Kitchen cooking class taught by Robin Davis, food editor of the Columbus Dispatch and a James Beard award winner. It was instantly clear that Robin is an experienced teacher and demonstrator. Everything was perfectly organized with ingredients for each course on separate labeled trays, every ingredient prepped and every plate piled up. This made volunteering a pleasure and I was able to sit at the back and for the most part learn with the rest of the students. Classes at the Dispatch Kitchen are not just educational – they are delicious. It’s more like dinner and a demo. Watch and learn, then eat. There is an overhead camera so you can really see what is going on and all the recipes and instructions are printed so that you only need to annotate rather than scribble notes. There are things that you might want to scribble because Robin is a mine of useful information – how many tablespoons of juice to expect from a lemon, what temperature a simmer equates to, and how to tell when salmon is cooked through – and fun stories. Grilled marinated shrimp on a lightly dressed salad of greens and apples. An interesting and refreshing combination. Spaghetti san Valentino, a crab, fennel, tomato, garlic and white wine sauce with lots of butter that was reminiscent of bouillabaisse. Roasted Salmon with Mahogany Glaze, served with celery root puree. The glaze was made with molasses to add sweetness and color and was so good that I wanted to lick it up. Brushing extra glaze on after it was cooked really intensified the flavor too. Salty Caramel Sauce with Jeni’s honey bean vanilla ice cream. Here the sea component was sea salt. Would it be too much to have that on salty caramel? I don’t think so. I am usually wary of boiling sugar at home, but this sauce was simple and delicious enough for me to attempt it. Robin suggested that we could use it for caramel popcorn, now there’s a thought! The best thing about the menu was that these were all dishes that you could see yourself making at home. The only daunting thing might be picking crab meat. It is essential to use whole crabs as the shells contribute both to the taste and color. I always learn something new in any class and cooking with crab shells was new to me. Apparently the purists will actually grind up the shells and add them to thicken the sauce. Another gem I took away was to cook celery root in milk to give it a silkier texture. I love celery root and often serve it mashed either alone or instead of mashed potato. The milk definitely improved the texture of puree. I highly recommend the Dispatch Kitchen classes, both the classes taught by Robin and those taught by guest chefs from around the city. If you have never cooked Thanksgiving dinner before, make a bee-line for the Thanksgiving boot camp on November 8th where you will learn all about turkeys, pies and stuffing. Upcoming Chef series classes include Richard Blondin from the Refectory and Paul Yow from Barcelona. Today was a perfect morning for a walk to the North Market Farmers Market. Beautiful early morning sunlight, dew on the grass and cool in the shadows. The air was clear, the sky was blue and the park is full of flowers. I love August already. The farmers market was also full of flowers and I couldn’t resist a colorful bunch of zinnias, which are just so summery and remind me of my grandmother. 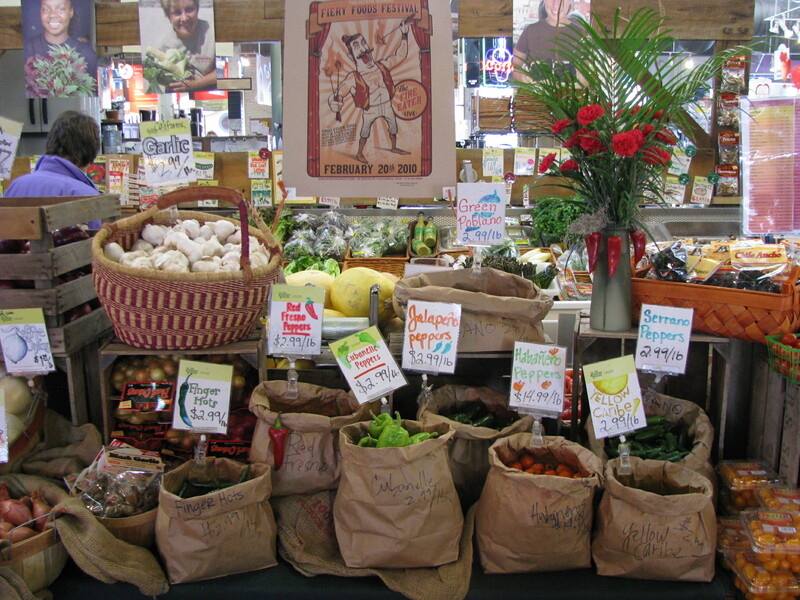 Walking around the market was a feast of color with the fragrance of basil in the air. Peaches are in season now with blackberries, blueberries,cantaloupes, apricots and apples. I made a fruit salad last week with peaches, blueberries and apricots which I ate with greek yoghurt and some honey for breakfast. There were all kinds of zucchini and eggplants and although it isn’t prime tomato season you can tell that it isn’t far off. I grilled some small eggplants last week and made Baba Ganoush. It is very similar to hummus but with a smoother texture and a delicate smokiness. The recipe is below. The Farmers market makes you realize how generic and boring most supermarket vegetables are. I love Wayward Seed Farm’s Dragon carrots and these multi colored cauliflowers caught my eye in the market this morning. One of the more unusual things I found at Toad Hill Organics was Purslane. Tim often has greens that you don’t see elsewhere, last week he also had Lambs quarters. This was the first time I had tried purslane. It has an interesting taste and texture. It looks a little like watercress but it is much more sturdy. It is crunchy but there is something slightly slimy about it once you chew it. 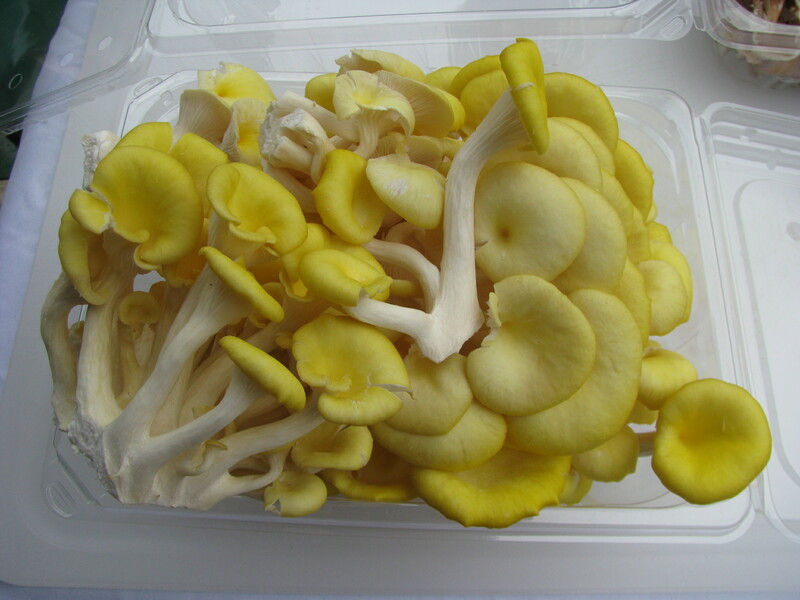 It is very fresh tasting and the stems in particular have a strong citrus flavor. Apparently you can cook it, and use it as a thickener in soups and stews, but we just ate it in a salad. The citrusy flavor went well with crab cakes. I also bought cherry tomatoes, corn and green beans to make one of my favorite Peter Berley salads for a pot luck tomorrow; Austrian crescent fingerling potatoes and candy stripe beets, and eggs and rainbow chard to make our Slow Food Fritatta. Grill the eggplants. You can either do this over a gas flame on your stove, under the grill or on the barbecue. The latter is preferable. You want to blacken the skin, but do it slowly enough that the eggplant inside will soften. Mine blackened too quickly and I ended up gently sauteeing the eggplant in olive oil to soften it further. When the skins are charred, allow the eggplant to cool slightly (if you put them in a ziplock bag the steam will help to cook the eggplant and loosen the skin). Then scrape and wash off the skin under cold running water. Put the eggplant and the rest of the ingredients into the food processor and whizz until smooth. Taste and add more of any of the seasonings to your preference. The North Market’s Food and Ohio Wine Festival is held right on our door step and I proposed the idea that we should have a Slow Food table to raise awareness of the Slow Food movement and recruit some new members. 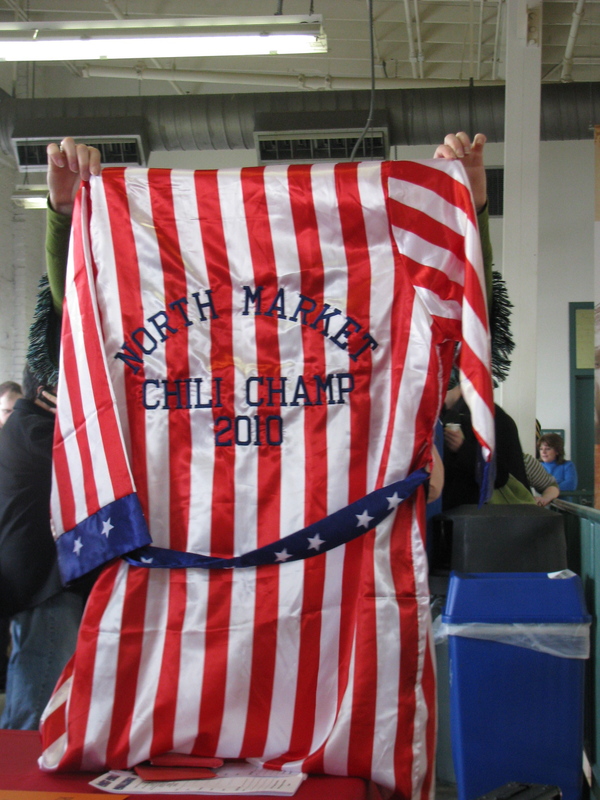 Unfortunately by the time I had this idea it was too late for us to have a table, but North Market Marketing Director Mary Martineau suggested that we could do a cookery demonstration. This sounded like fun and Colleen who is a former professional chef agreed to take the lead. We were committed. Sometimes things that sound simple in practice turn out to be more complicated and three opinionated foodies trying to decide what to cook for a demonstration turned out to be one of these things. There were just too many options. In addition we were trying to live up to the Slow Food ideals of ‘Good, Clean and Fair’, use seasonal local produce and incorporate some Ark of Taste products. What a shame it isn’t paw paw season! We spent most of the week discussing recipes, trying and testing variations, discussing pros and cons and working out what we needed to say, make and buy. Finally on Saturday morning we had tested, tasted, shopped and chopped and we were ready. The demonstration was to be held in the new Ohio Proud mobile kitchen, complete with three TV screens, microphones and of course the proverbial kitchen sink. Our menu was a Swiss chard and goat cheese frittata, roasted cauliflower and roasted beets with mint and cumin. All three dishes highlight local seasonal produce (mostly from Wayward Seed Farm) and hopefully gave people some new ideas for preparing them. We used Chiogga beets which are also known as candy strip or bulls eye beets and they have red and white stripes when you cut into them. We also mixed in some of the beet greens with the chard for the frittata. The Ark of Taste product that we incorporated was Alaea salt from Hawaii which has a beautiful terracotta color (due to the addition of red volcanic clay) and makes a wonderful finishing salt, especially on something pale like the cauliflower. Colleen did all the talking and I assisting making sure that everything was to hand and keeping a check on the oven. The demonstration went really well, except for the weather. The sky looked really ominous and we had been told that we would have to stop if the rain was heavy. We rushed through the menu and were just finishing when it started pouring. Trying to serve food in the rain and pack everything up was pretty hectic, but people were lining up in the rain to try things and the food all disappeared despite the thunderstorm. We had some great reactions to the food and it was fun chatting to people afterwards. The cauliflower had brown crunchy bits and was really delicious. I heard more than one person say that it was the best cauliflower they had ever tasted, they could not believe that it only had olive oil, salt and pepper. Preheat oven to 400˚. Break cauliflower into florets and toss with olive oil. Salt and pepper to taste. Roast for 25 minutes, or until browned on ends. Preheat oven to 350˚. Saute onion and garlic in 12″ nonstick frying pan until onion is translucent. 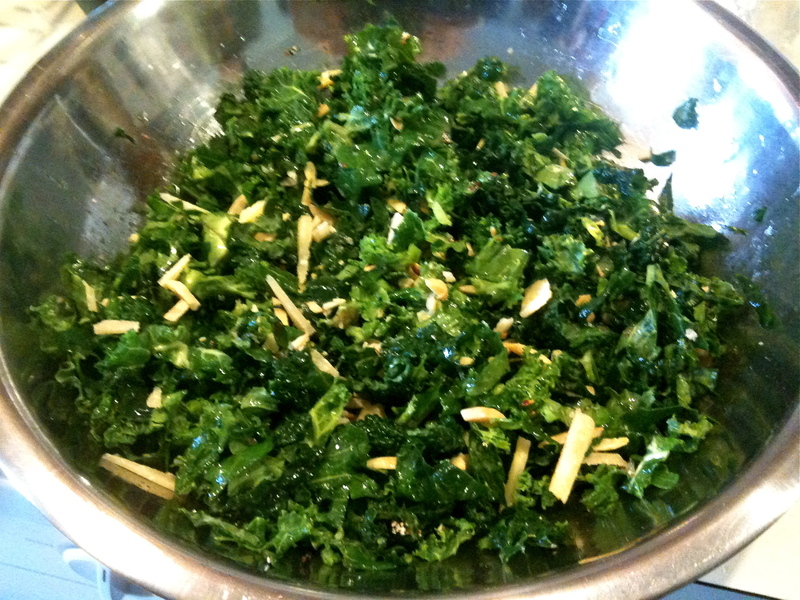 Add the chard stems and saute for a few minutes. Add the leaves, and salt/pepper to taste. When the chard has wilted, pour in the beaten eggs. Crumble the goat cheese over the surface. Remove from heat and place in oven for 8 minutes or until egg has set and cooked through. 6 medium beets (1-1/4 lbs. without greens), trimmed, leaving 1″ stems attached. Stir together lemon juice, cumin seeds, salt, and pepper in medium bowl. Stir in oil and let stand while roasting beets. Put oven rack in middle position and preheat oven to 425˚. Wrap beets tightly in double layer of foil and roast on baking sheet until tender, 1 hour to 1 hour 15 min. Cool to warm in foil, about 20 min. When beets are cool enough to handle, peel them, discarding stems and root ends, then cut into 1/4-1/2″ wide wedges.